Featuring an image of a flock of birds on its cover, the third album completes a conceptual triptych dedicated to the three social strata of our civilization. In 'Let iT. 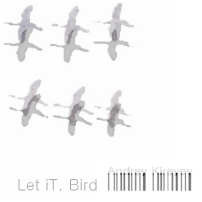 Bird', Andrey Kireyev uses samples the sounds of the band Talking Bird (T. Bird) to suggest that birds are creatures which have evolved for flight, not for idle chatter or conversation, and that they must do what humans can only dream about fly.